When practice ended, Snoop went onto the field to break the huddle in the tradition of [Ray] Lewis. "What time is it?" Snoop shouted. "Are my dogs in the house?" he yelled. "Woof, woof, woof," they answered. In all fairness, Mr. Dogg and Mr. Lewis have something in common: "legal issues" sub-sections of their Wikipedia pages. They're like peas in a pod. 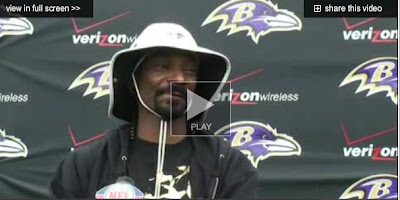 And to Snoop Dogg, I say that pod can stay in Baltimore as far as Steeler fans are concerned. Consider yourself Canine non grata. Glad you took notice. When this first broke I thought WTF!?! too. Traitor, or never a true fan. You pick. Who cares? His 15 minutes was up years ago. I'm sure he'll find another team to latch onto as soon as this Ravens thing gets old. The article from SI said some guy follows him around carrying his umbrella...WTF. Can't say it's a big loss. Oddly enough he just scheduled a very rare small club show at Mr. Small's in Millvale for the day after the Steelers home opener. I don't see him doing this for his dog's in Baltimore. I'm betting that he has plans to be at the game the night before (you know, when the season counts). The D-O-double-G is still OK in my book. This is OUTRAGEOUS!!! I'm so disillusioned. Umm, who or what is a "Snoop Dogg"?? Asks a 40 year old yelling at the kids to get off his lawn. I feel like Michael Corleone discovering his brother Fredo's betrayal. "You are dead to me". Snoop should be careful of any offers from Steeler fans to go fishing. I am not ready to throw in the Terrible Towel on Snoop just yet...chances are he was just doing a little "scouting" for the Black-n-Gold.